Most Predators fans have attended a game at Bridgestone Arena, watched every captivating minute of the 2017 Stanley Cup, and remember exactly where they were when the team traded Shea Weber for P.K. Subban. But only real fans can tell you the origins of the catfish toss or know the full story of how hockey first came to Music City. Whether you've been a die-hard booster since '98 or are a more recent supporter of Filip Forsberg and Pekka Rinne, 100 Things Predators Fans Should Know & Do Before They Die stands as the ultimate resource for Smashville faithful. 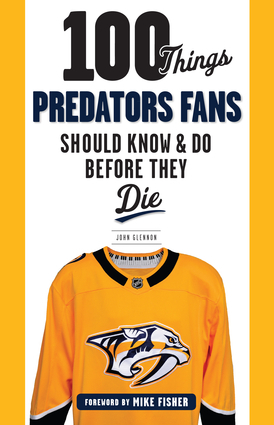 Nashville sportswriter John Glennon has collected every essential piece of Preds knowledge and trivia, as well as must-do activities, and ranks them all from 1 to 100, providing an entertaining and easy-to-follow checklist as you progress on your way to fan superstardom. John Glennon is a journalist who has covered Nashville sports for over 20 years, including 12 years as the Predators beat reporter for The Tennessean. A native of Alexandria, VA, Glennon graduated with a BA in English from the University of Virginia. This is his first book.